Boris Ajeganov is Junior Research Fellow with the Central Asia-Caucasus Institute and Silk Road Studies Program Joint Center. 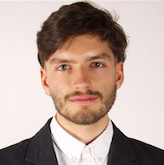 He is an MSc candidate in EU Politics at the London School of Economics and Political Science and an MA candidate in Political Science at Stockholm University. He is also Assistant Editor of the Central Asia-Caucasus Analyst. Uzbekistan after Karimov: a EU on the sidelines?